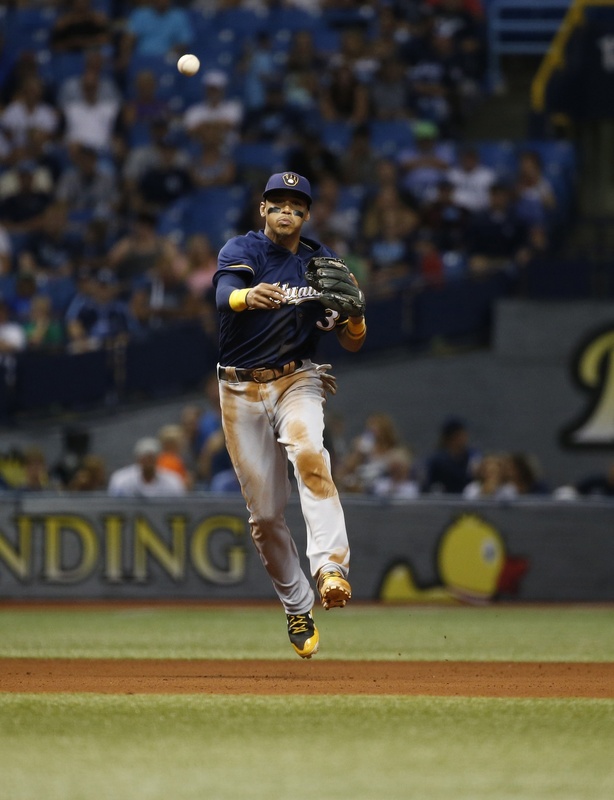 By Baseball Prospectus’ WARP, Orlando Arcia has been the Brewers’ second-best position player, which is certainly an accomplishment given that he is the youngest player on the team. He has contributed both offensively and defensively, as his .261 TAv is right at the league average of .260, and his 7.1 FRAA is third among shortstops in all of baseball (statistics through Monday, August 7). Even though he was seen as a centerpiece of the next good Brewers team, I think it is fair to say that the fact that he is contributing in this way so early in his career is a surprise. Before Arcia made his big league debut in 2016, BP’s scouting team called him a “high-floor, high-ceiling player” because he was an elite defensive prospect and had the offensive potential to both make a lot of contact and drive the ball. We are used to seeing prospects fail for various reasons, but so far this season Arcia has done exactly what that scouting report suggested he would. I have already mentioned his defensive acumen, but it is worth highlighting again. Defense peaks early, but Arcia has just turned 23 and already appears to be one of the best defensive shortstops in baseball. Two of the three publicly available defensive rating systems—FRAA (Baseball Prospectus) and DRS (Baseball-Reference)—agree that he is near the top of the list, and only UZR (Fangraphs) thinks that he is a negative. UZR punishes specifically for errors, however, which punishes Arcia more severely than it would other players because his strength is range; he does have a tendency to boot easy plays. However, given that he was expected to be a good defender and two of the three metrics believe that he is, including BP’s FRAA, it is safe to say that he has not disappointed on that end. The pre-2016 scouting report also indicated that Arcia had solid bat control and an ability to make contact. This skill has also been present thus far in 2017, as he is hitting .279, which is in the top third of shortstops with at least 100 plate appearances. He is walking less often than league average, but he is also striking out less often, so there is room for improvement but he is not a disaster. The final piece of that scouting report was Arcia’s improved power. It is this aspect of his skillset that shot him up prospect lists because good defensive shortstops with empty batting averages are useful players but not foundational pieces. Arcia, though, improved his ability to hit for power in the minor leagues, and this has carried over to the big leagues. His .141 ISO places him right in the middle of shortstops with at least 250 plate appearances, while his .420 SLG ranks him slightly higher. Overall, he has impressed at the plate. Most remarkably, in his first full season, Arcia has performed exactly the way one would have projected his best-case scenario. He has been an excellent defender, he has hit for a reasonable batting average, and has showed enough power to make him an offensive threat. He appears to be an above-average major league regular, and he is bordering on All Star caliber if his play thus far in 2017 is indicative of how he will perform going forward. This outcome is worth comparing to another shortstop ranked comparably highly on BP’s Top 101 prior to the 2016 season. Arcia, who was ranked twelfth, could have been said to be similarly situated to J.P. Crawford, who was ranked fourth. Both were close to the big leagues and expected to be the centerpiece of young, rebuilding teams. Arcia, though, has lived up to the hype, while Crawford has not. After playing 87 games in Triple-A last season, Crawford is essentially repeating the level while showing some improvement, but he still is not hitting particularly well. BP’s midseason top 50 pointed out that he remains a quality prospect because of his glove but that it is fair to wonder how good a hitter he is. It is not that hard to look back on the past year-plus for both Arcia and Crawford and determine what went right for Arcia and what has gone wrong for Crawford. What is harder, though, is knowing at the beginning of 2016 which player was going to succeed. Front offices have scouts and analysts trying (and sometimes failing) to answer this question, so I am not going to pretend as if I know the answer. However, I do feel comfortable saying that it is some combination of luck, good player development, and credit to the player for improving. Because Arcia has produced in the way he was thought to be capable of, the Brewers are in a good position. They have quality starters at other positions as well, and having a quality shortstop allows utility players to fill in at positions they are more comfortable in (such as allowing Hernan Perez to play second base, third base, and some outfield instead of stretching him at shortstop). Arcia is young, cost-controlled, and under team control, and the Brewers can take some of their savings at his position and invest in their rotation and bullpen where the money is necessary. On the other hand, the Phillies do not have their foundational piece; instead, they are left hoping that Crawford realizes the potential that still remains within him. If he turns into Arcia, they will be thrilled. The Brewers already have theirs, however.